I have found my new favorite mobile app. 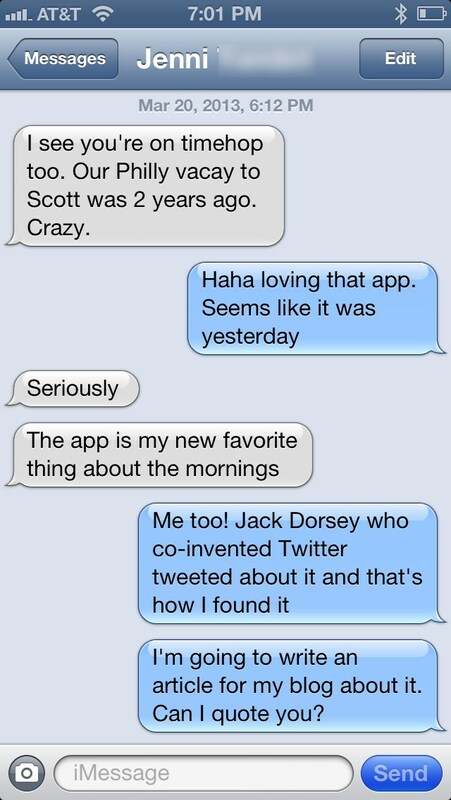 I follow Jack Dorsey, founder of Twitter, on Twitter and he tweeted to check out Time Hop. Time Hop, in it’s simplest form, will analyze your social media and will tell you what you did on this on any given day in years past. Mine is only hooked up to my Facebook Page, but it has given me great stuff so far. After I saw this, I went to the app store and downloaded it, synced it with Facebook and it prompted me to wait until the next day until I could see my first time hop. That next day rolled around and I was so happy with what I saw. Time Hop will send you a push notification in the morning that says your Time Hope is ready. So far the app has shown me what I did on Spring Break 4 years ago, and my trip to Philly 2 years ago. I promptly texted my friends who I was with and reminisced. What I like most about the Time Hop is that you can get a feed of your friends and what they did a year ago. 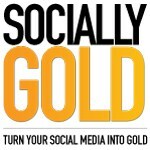 You can can also choose to share your Time Hop to your social media sites, but you don’t have to. I only have a few Facebook friends on Time Hop right now, but I got a text message from a friend that loves it as much as I do. You can download Time Hop by going to the Apple app store. It doesn’t look like they have a Time Hop Android app yet. Are you using Time Hop? Let us know in the comments what you think?